So I just realized that Spring Break is like, weeks away. I haven’t even written about last year’s Spring Break yet and it’s almost time for the next one. Way to go, me. I have been meaning to start a topic category here on the old blog called “Southern Three Day Weekends” or something like that. I want to share my vacation ideas and hear from others who like to travel with their preschool kids to get ideas on where to take them. 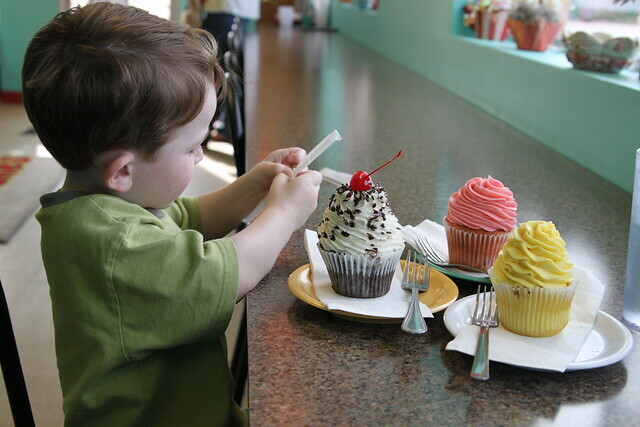 Traveling with a four year old isn’t exactly a walk in the park, so I like to be as prepared as possible. Reading about and seeing pictures from other people’s trips always helps me get a sense of what a city has to offer. Even before G came along I was always a huge TripAdvisor fan. Some of y’all might like uncharted waters, but in my house every new vacation destination needs hours of background research on things to do, places to see, fun things to experience, etc. 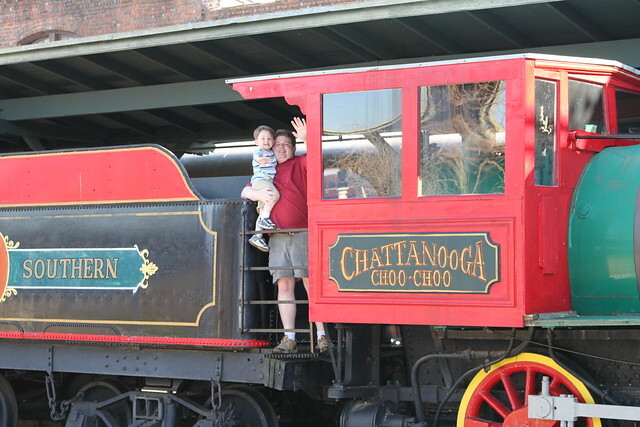 So, let me share our Spring Break 2011 trip report to Chattanooga, Tennessee with all you folks out there who might be searching for a fun kid-friendly vacation destination this year. 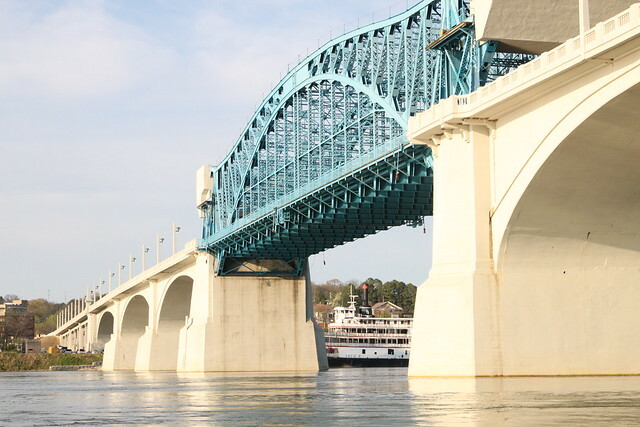 Chattanooga is located in southeastern Tennessee, so it’s only about a two and a half hour drive from us here in Birmingham. That alone put it at the top of my vacation choices for Garrett’s sake. Since I don’t have one of those kids who falls asleep instantly as soon as the tires hit the highway, the shorter the car ride, the better. 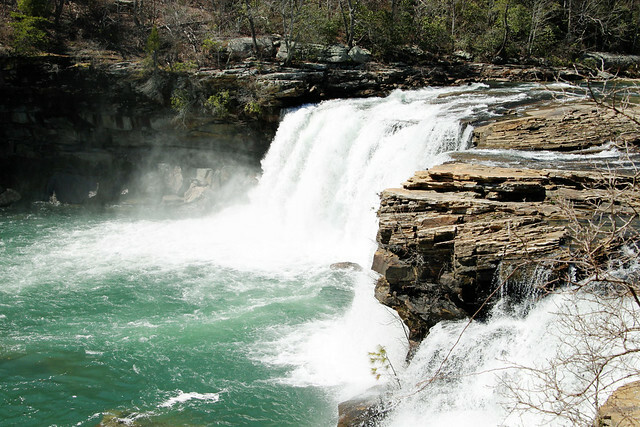 We made a short detour along the way to see Little River Falls near Fort Payne, Alabama.. 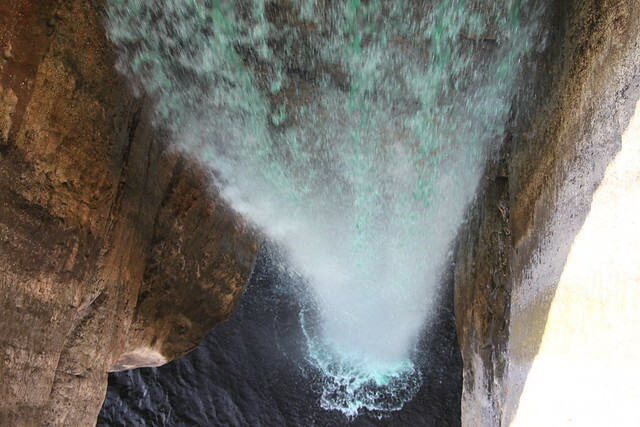 I have already blogged about that part of the trip here if you’d like to see more photos of the waterfall. Beautiful place, and Garrett loved seeing the huge waterfall. After that we headed up the back roads into Chattanooga. Our first stop (even before the hotel!) 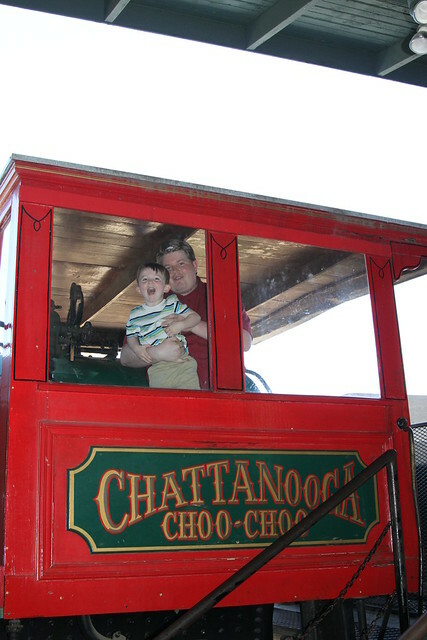 was at the Chattanooga Choo-Choo. It was a Friday afternoon, so there weren’t many people there at all. In fact, we pretty much had the place to ourselves. 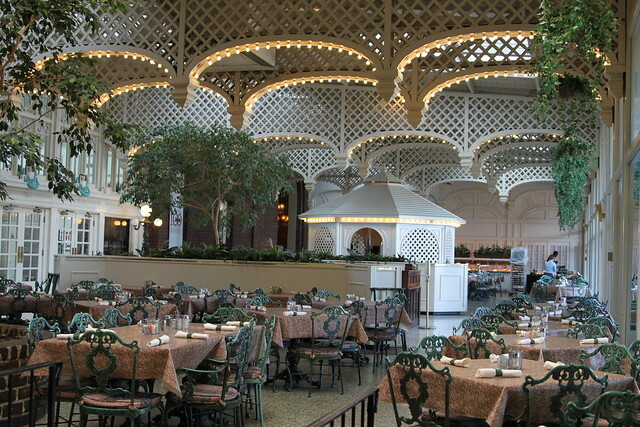 Here is the dining room, aka the place where lattice goes to die. A few of the shops were open, but not all of them, so we mostly wandered around and looked at the trains. My loco-for-locomotives addict had a blast climbing all over the trains and running up and down between the cars. His daddy had fun trying to keep up with him while I snapped pics from afar. That’s a joke, btw. I snapped some pics up close, too. 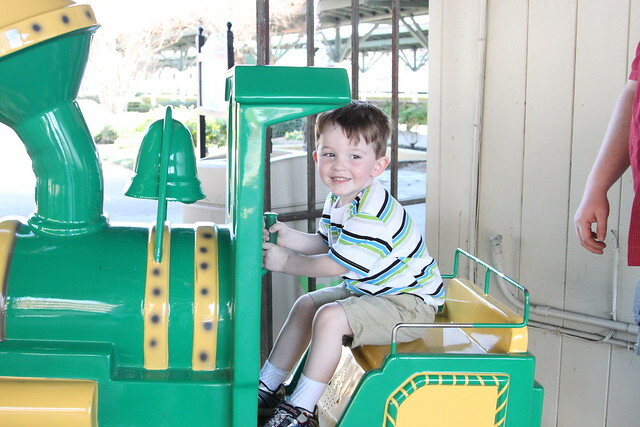 Since the Choo Choo trains didn’t move, Garrett settled for a whirl on the quarter train ride out front. I think he had an equal amount of fun on that train than the others. And hey! Quarters. Yeah. I’ll take it. Jam out with your clam out, kid. 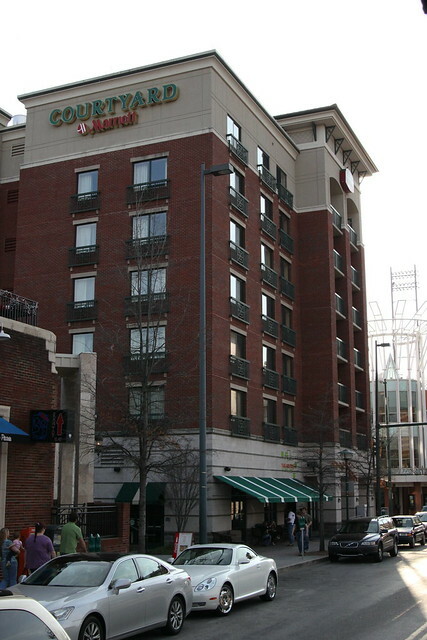 After a few gallops on the mini-train, we headed down to check into our hotel, the Courtyard by Marriott Chattanooga Downtown. The big draw of this hotel? Location, location, location. 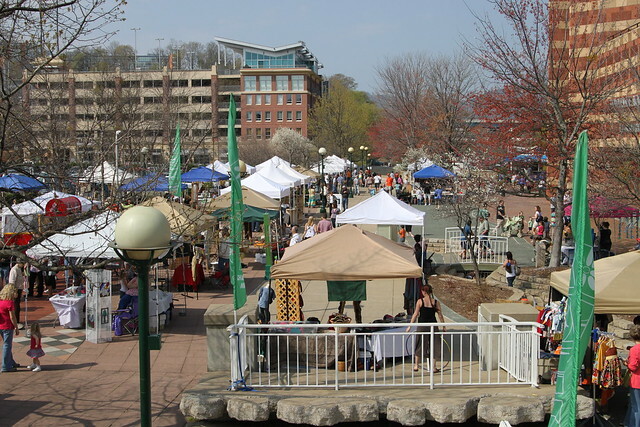 It is located directly across the street from the Tennessee Aquarium and the IMAX theater and within blocks of almost everything that downtown Chattanooga has to offer. It was a perfect place to stay for a family vacation when you want to park your car and walk around the city for the weekend. There was a coffee shop inside, along with a nice lobby and a beautiful little courtyard area that had a firepit and plenty of loungers where I sat and read magazines. Very peaceful. 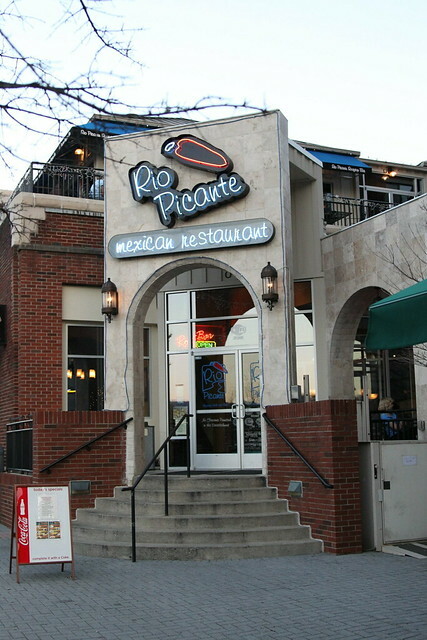 Right next door to the hotel was a fabulous Mexican restaurant called Rio Picante. 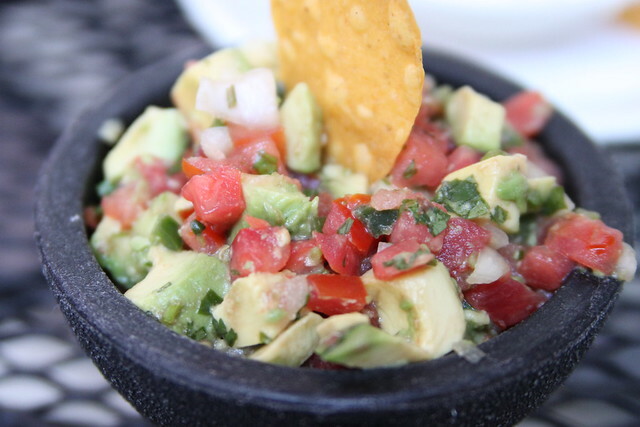 Garrett and I ate some of the best homemade guacamole that I’ve ever encountered in a Mexican restaurant. Yum. 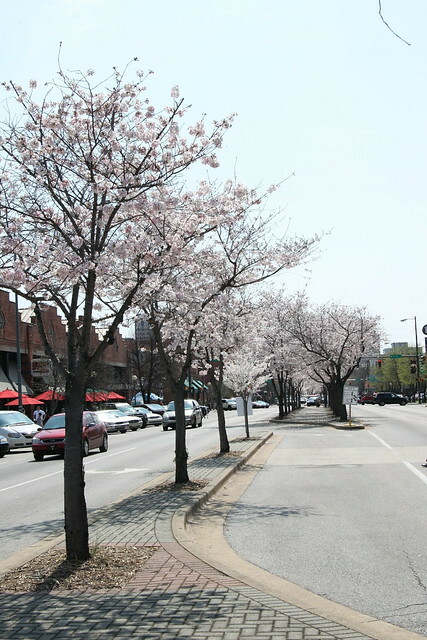 Chattanooga is a beautiful city that has made lots of strides for revitalization in the past few decades. 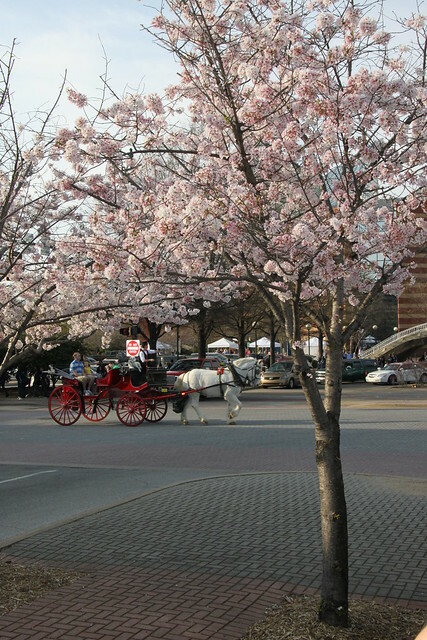 We were there in March and all the cherry trees were in full bloom. On Saturday morning we woke up early to see vendor booths going up in the parking lot of the aquarium. Score! I love me some craft vendor booths! So we wandered through those on the way to see the fishies. We bought our tickets from an automated machine which means we had NO direction from a live person on how to take the tour. This proved to be a mistake in a lot of ways, including missing an ENTIRE BUILDING of the aquarium where there are butterflies and penguins and other coolness. I’ll get to that in a minute, though. We made our way inside the aquarium, and things got a little confusing. The aquarium is built so that you start at the top and work your way down a series of ramps. This isn’t really marked on any maps or indicated by anyone who gives you a ticket, so I’m not sure how you’re supposed to automatically know to do that unless you’ve been there on a field trip before. But we figured it out pretty quickly as we were trying to make our way against the crowds coming down the ramp because we were the dummies that started at the bottom. So next time, we will start on the top level and leisurely stroll to the bottom instead of playing salmon and trying to swim upstream. Once we finally arrived at the top level, it was awesome! There was a big enclosed solarium area with “caves” and otters playing and stuff. Super neat. There was one section that looked like The Everglades, with lots of creepy crawlies and slithering things. Alligators all over the place! 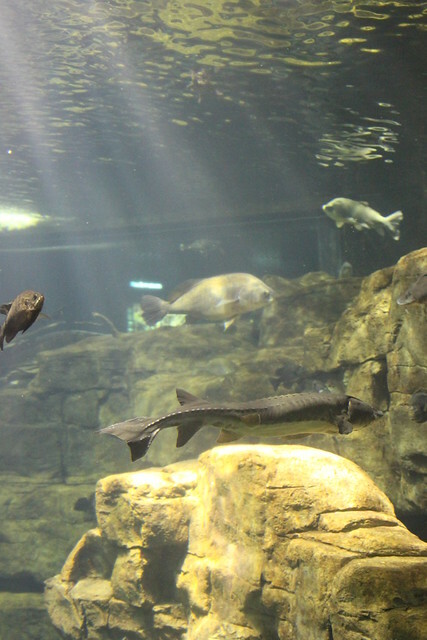 The River building of the aquarium features a lot of freshwater fish from the Southeastern USA, so don’t go expecting a ton of giant sharks and colorful tropical fish. Those are over in the Ocean journey building that we missed completely. 🙁 We had no idea it was there until we took the boat tour and the captain pointed it out. I’ll tell you more in a minute. 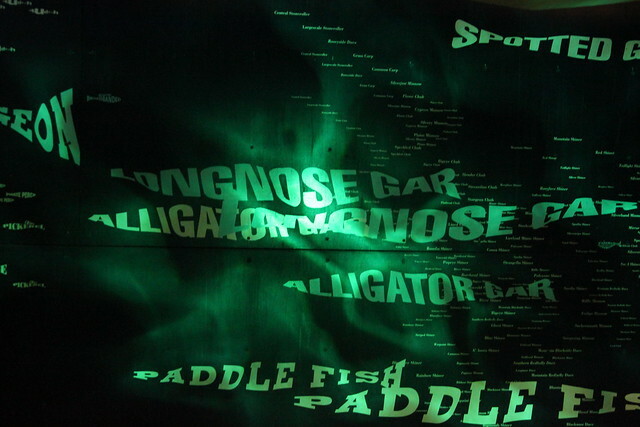 There is a definitely a little bit of everything from the waters of the world, but in this building you’re going to see lots of trout and bass and alligator gar and catfish. 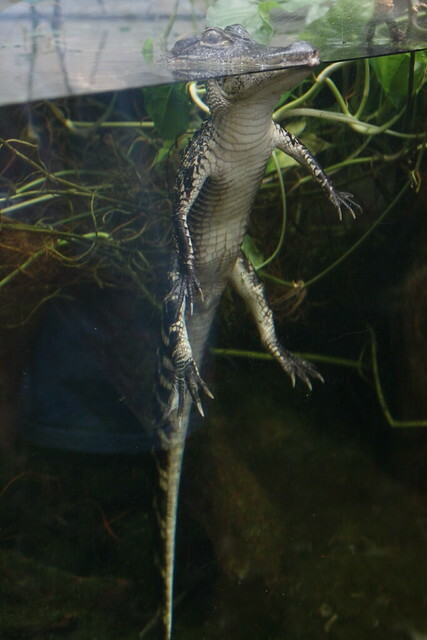 As an Alabama green Warrior river rat, I love this type of aquarium. 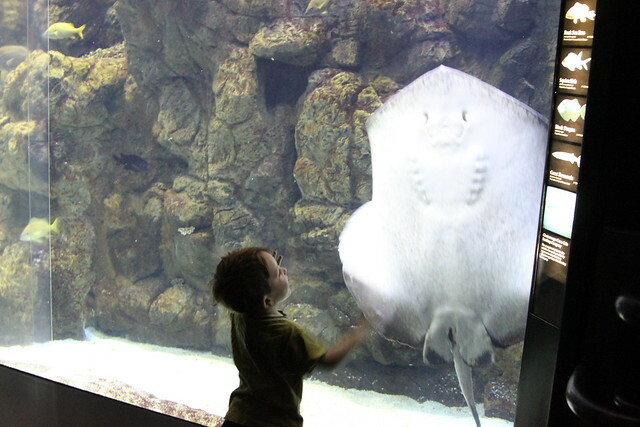 We saw a salt water tank and a few sharks, but Garrett was more impressed by this HUGE sting ray. Look at this sucker! He also loved the turtles. 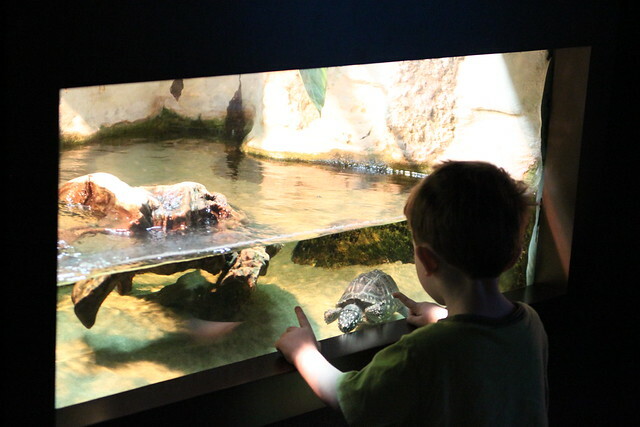 We spent more time in the turtle tank section than any other. 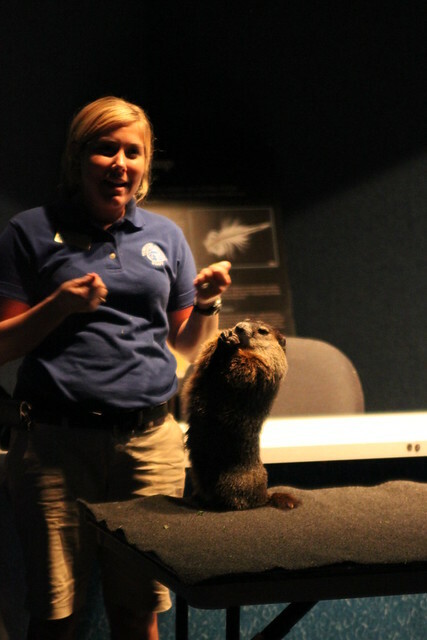 We got to see how much wood a woodchuck could chuck if a Woodchuck could chuck wood. 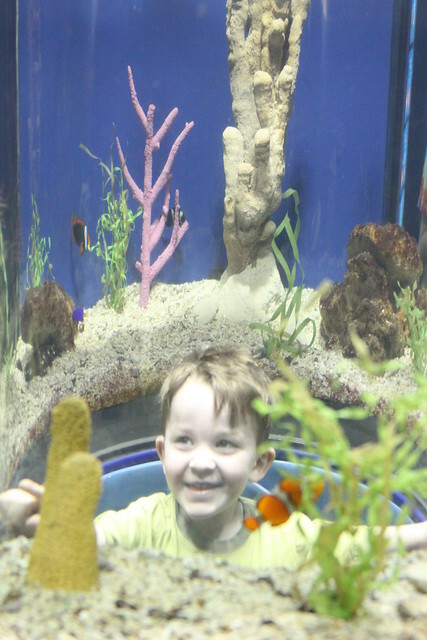 And he absolutely loved sticking his head inside the Nemo tank. After spending a few hours walking around the aquarium and taking a bunch of pics of fish, we headed out to get some lunch and go back to the room for a rest. Then after we recharged the batts for a little bit, we headed back out to see what else downtown had to offer. There were a bunch of cute shops and restaurants. We had to stop in at the Moon Pie General Store. 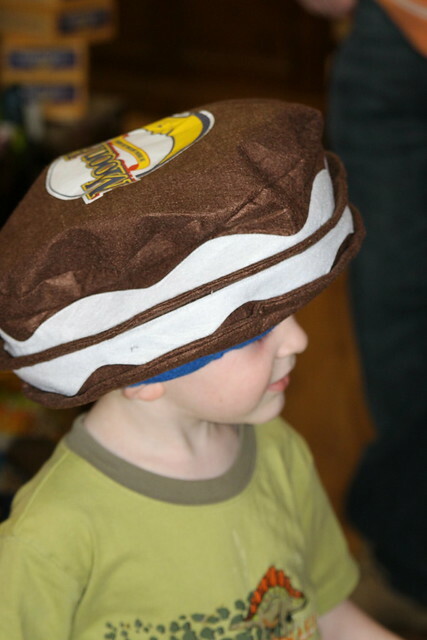 It took a lot for me not to buy this moon pie hat for G. No, not really. I was happy with a picture. 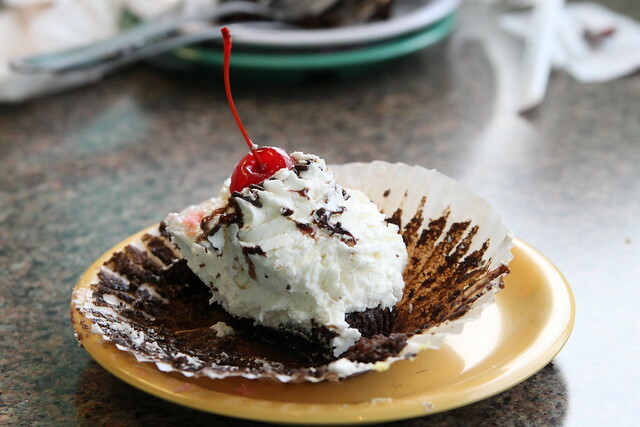 Those cupcakes were GOOD. We still had time to kill, so we pulled out Garrett’s favorite toy at the time and let him play for a while. 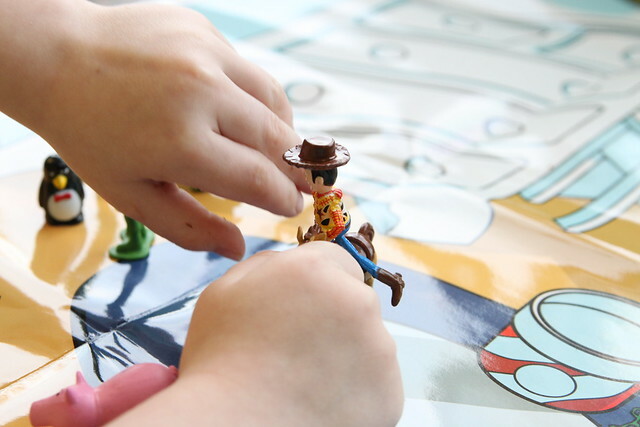 I found this Toy Story interactive “My Busy Book” with miniature figurine characters and a fold out of play map of Andy’s room at TJMaxx Homegoods. Garrett LOVED this book. We found another one that was Thomas the Train that he devoured as well. These books have provided us with hours of entertainment over the past year- both at home and on vacation. Finally it was time to head back to the aquaducks place and board our aquatic vehicle. The guys were nice enough to let us leave the stroller parked beside their van so we didn’t have to squeeze it aboard the tiny truck/boat. The duck tour drives you through the city and heads over to the boat ramp to enter the Tennessee River. We had the privilege of watching another boat enter the water right behind us so I made y’all a snapshot video of what it looks like. When these things hit the water it’s no joke. You might get a little bit wet sitting on the very back. Garrett LOVED it. We cruised up and back down the river on about an hour long tour. It was on the boat tour that we realized that the aquarium has a WHOLE OTHER BUILDING that we completely missed seeing when we were there. WHATWHAT?? Ugh, I was so disappointed to hear this. The new building features a butterfly garden and a penguin exhibit and all sorts of coolness that Garrett would have LOVED seeing but by the time we got back they were closed. Yep, we missed it because we didn’t do our research on the place. Yet another reason I hate to be unprepared for vacations. 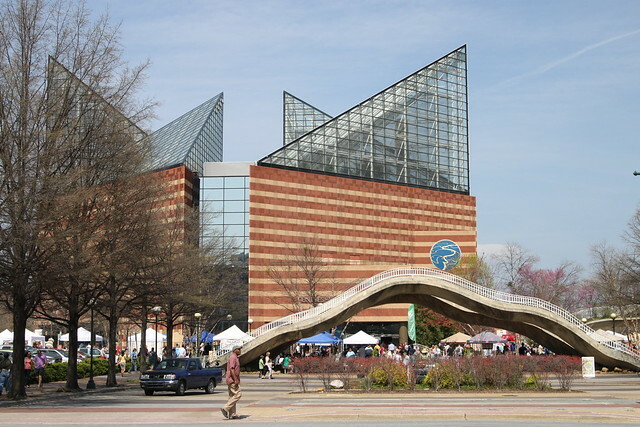 So, for anyone out there thinking of taking a trip to the Chattanooga aquarium soon, be sure to go into the second building and see the rest of it! Our boat captain tour guide was a MESS, telling us all sorts of crazy stories about the city and history and his personal experiences. We went under the bridge and saw the paddle boat. We passed by Little Debbie’s house and heard her story, and also all the scandal surrounding the HGTV Dream house that was built and resold and nearly fell off the side of the mountain in 2007. It was informative and interesting stuff. The Captain made us laugh, and he let some of the kids drive the boat for a while. It was fun. Definitely rec this tour for the littles. 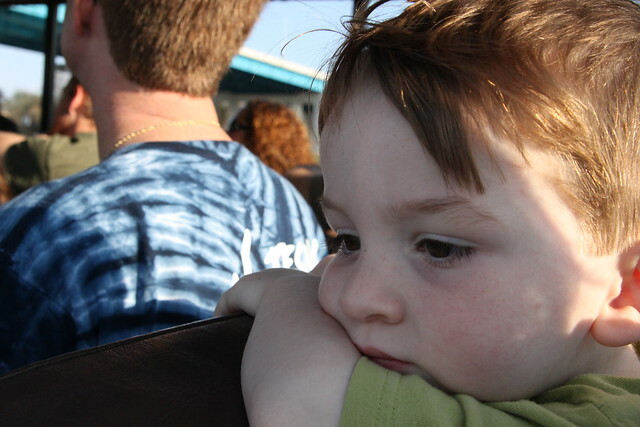 The boat ride was so hypnotizing to G after a while I thought he might fall asleep, but he hung in there. After the tour it was getting dark so we headed out for some dinner at before going back to the room. There are tons of great restaurants down near the aquarium, so I doubt you could go wrong with any of them. We like to eat at non-chain places and there are a good deal of those along with many of the old stand-bys. This wrapped up Saturday for us because G was worn out from all the walking (and I was too, I won’t lie). After that we headed back across the river to the top of Lookout Mountain to See Rock City! 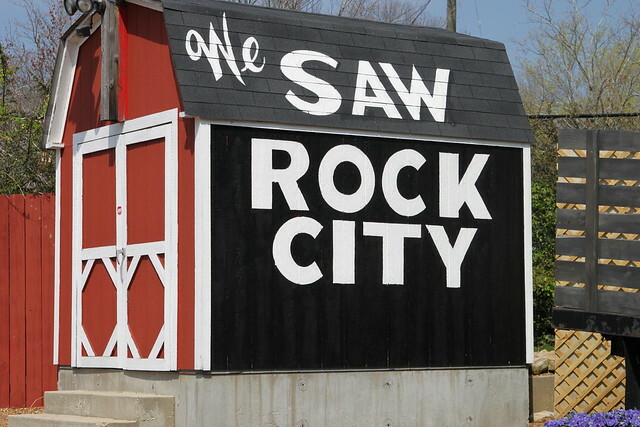 My whole life I’ve lived in the South and seen red and black birdhouses and go barns commanding me to See Rock City. I finally listened to all those birdhouses and did it! And I’m so thankful that I did. It was beautiful. 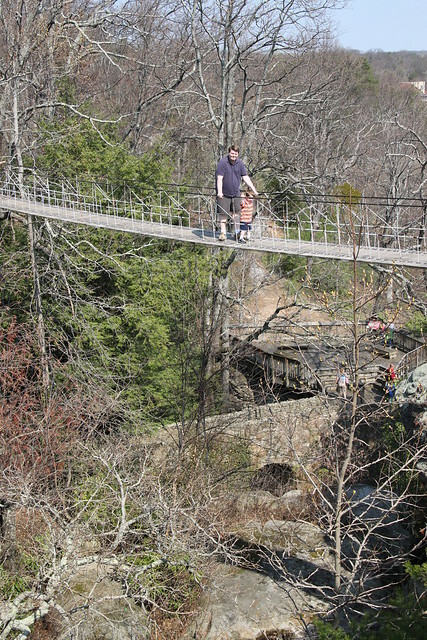 Garrett LOVED Rock City. 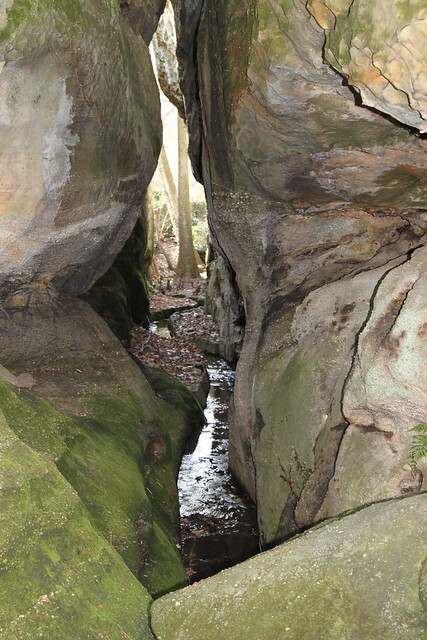 It is a winding path through rocks and cave like canyons with a fairy hollow kind of feeling to it. There are places in the world where you step into and feel like you’ve entered a magical place. The redwood forests in California are a good example of that. Butchart Gardens in Victoria is another one for me. And Rock City now falls on that list for me. It was cool, like temperature wise cool, and dark and shadowy and just plain interesting to see. I’ve never seen anything like it. 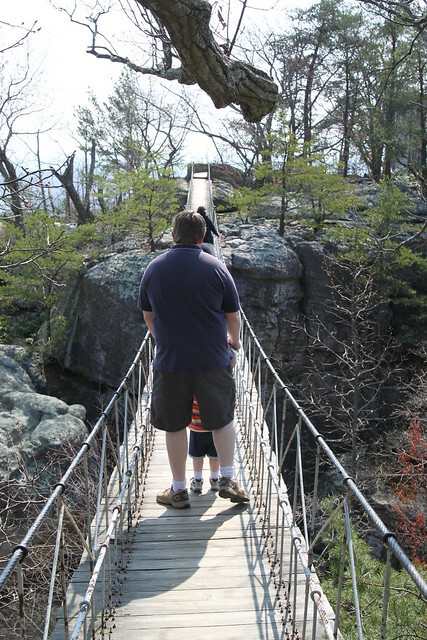 I will be candid and say that it concerned me a bit to go to Rock City as two out-of-shape parents with a preschooler, but it was fine. The Fat Man’s squeeze is on it’s own loop around the park, so you can choose not to take that route if you don’t want your fat man (or woman, in my case) to get squeezed. This was a relief to me. The rest of the park was pretty easily walkable as long as you can go up and down rock steps. 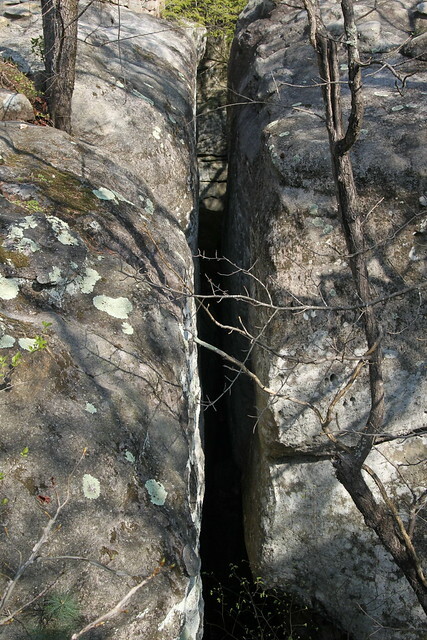 But if you’re claustrophobic you don’t have to go through too much of this. My 6’2″ husband had to duck a few times, though. The Shake Shake Bridge. Just like the one Thomas has to cross on Misty Island. He made us cross this thing over and over and over. We did laps around that place so he could walk across it with both of us. At least I got a picture of us together on that bridge! It’s a rare event for me to be in the vacation photos. Yeah he loved loved that bridge. 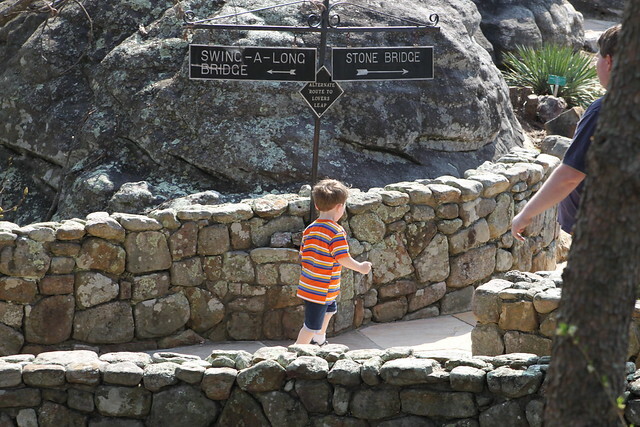 So if you don’t have a preschooler with you who wants to make non-stop continuous loops over the swinging rope bridge, you will likely get to enjoy the pinnacle of the whole place… the overlook where you can see 7 states on a clear day. We didn’t get to linger much at Lovers Leap because a certain 3 year old kept dragging us back toward the bridge, but there is a fantastic view of a waterfall that you can hang over and snap cool pics. I think they had dyed the water green for St Patty’s day while we were there. This waterfall was so confusing to me, because you can see it as you’re driving up Lookout Mountain and if you don’t know better (like me) you might assume that it is Ruby Falls. 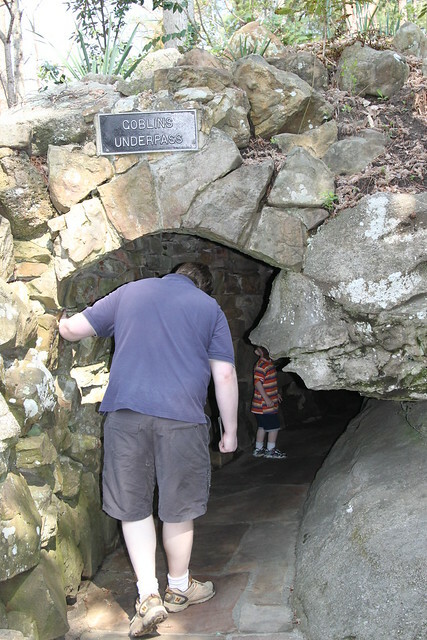 But nope, Ruby Falls is inside of a cave and it’s located about halfway down the other side of Lookout Mountain. If you want to see it, you’ll have to go to a different park entrance. 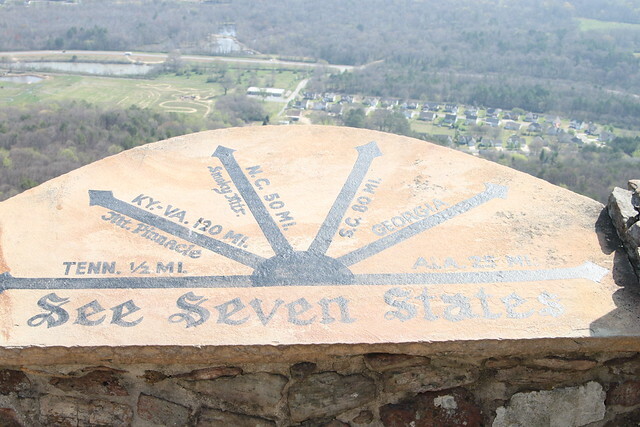 Just a tip, so you don’t drive all over Lookout Mountain trying to figure out the difference between Rock City and Ruby Falls like some crazy folks (us) might have done. Anyway… back to my story… J held on tight so G didn’t take any lover’s leaps over the edge. We finally pried Garrett away from the shake shake bridge and headed back to the entrance where we stopped along the way for silly photo ops. 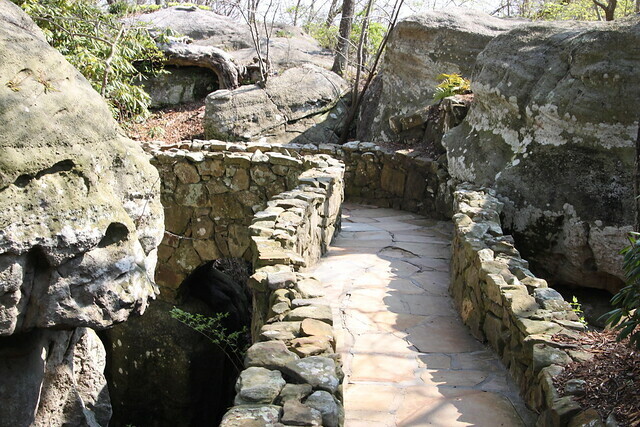 So finally, after 35 years as a southerner I can finally say that I Saw Rock City. Whew. It feels good to mark that off my bucket list. 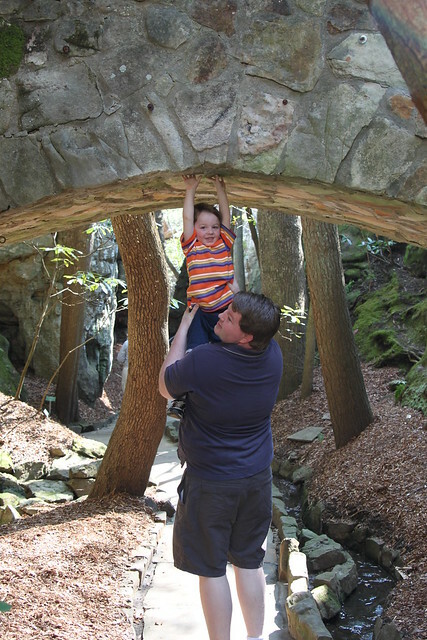 UPDATED TO ADD RUBY FALLS: While we didn’t see Ruby Falls on this particular trip, we visited it a few years later, and our son loved it! It’s a cave tour with a giant lit underground waterfall inside. 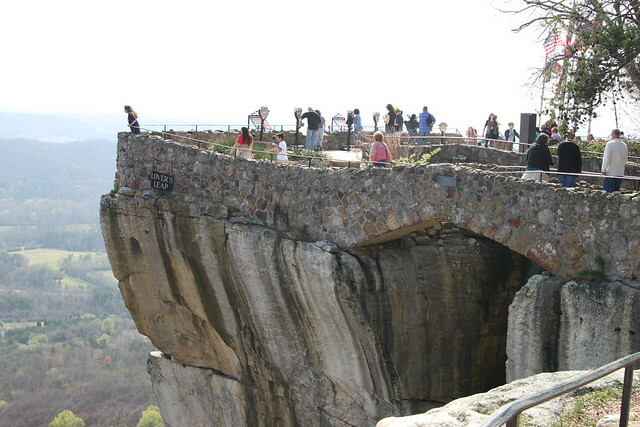 Just spectacular and a must-see if you visit Chattanooga! So there you have it. There was more to see and do in Chattanooga but that was it for our three day weekend. 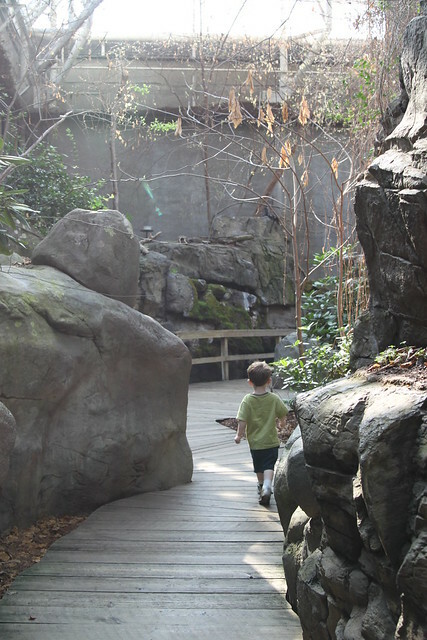 It was the perfect spot for a Spring Break trip with a preschooler. I think most kids under age 12 would enjoy Chattanooga. They have a good family thing going there. Definitely check it out if you’re in full on vacation planning mode like me. This was the best vacation we have taken with our toddler son. I highly recommend it to all parents. My favorite part was the duck truck/boat. Being a guy, what is not to love about a truck/boat? Driving on land, good; driving on water, good; being able to do both with a pull of a lever, AWESOME! 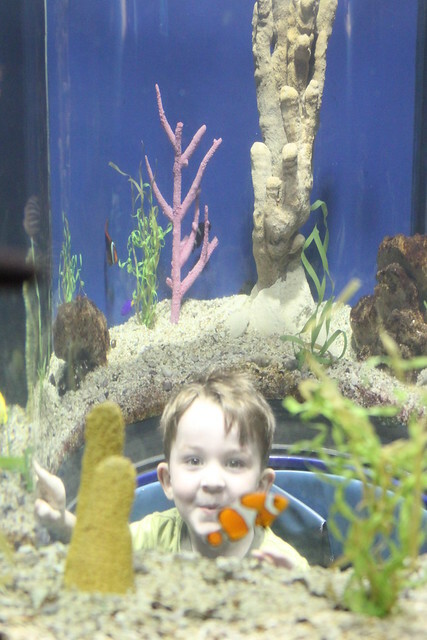 Loved seeing the aquarium and Rock City through your photos, Beth! 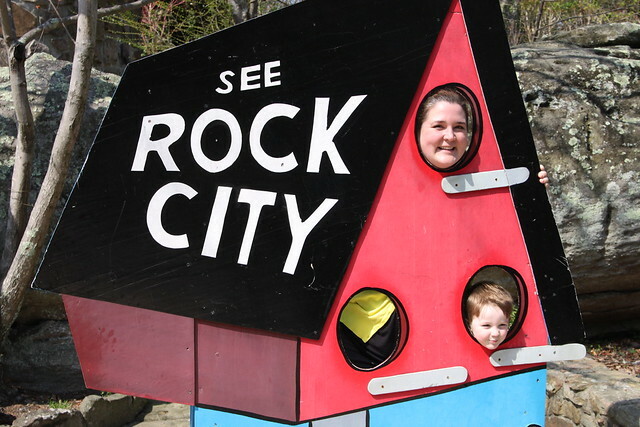 I have been a Nashvillian for 28 years, we raised two sons here in Nashville, and we managed to take them to several continents but they have NEVER seen Rock City. Boys are grown now, eldest has seen parts of the world you would NOT WANT to see ( Iraq, Afghanistan, a bunch more “Stans”. Youngest is a Junior at UT. I just may need to kidnap my family one Sunday when we are all at home, and we’ll go for a good old fashioned Sunday drive! Gorgeous photos. 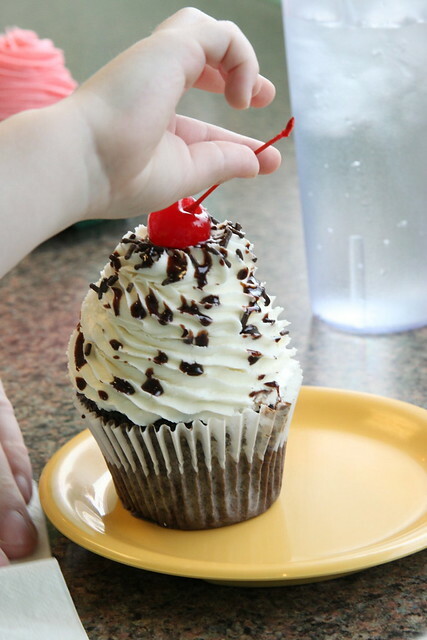 That’s my kind of cupcake. 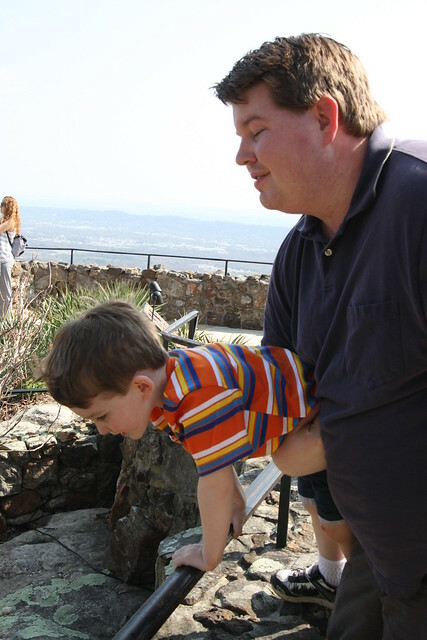 And, my heart stopped when I saw the photo of your little one over the rail, but hubby holding on to him. Only place I’ve been in TN was Pigeon Forge. Have to think of a low cost vacation for spring break! It’s only two weeks away and we get two weeks off! Hi there!! Discovered your blog a few months ago, been stopping by from time to time. I agree, Chattanooga is a great family vacation spot. My hubs and I went there a few years ago. 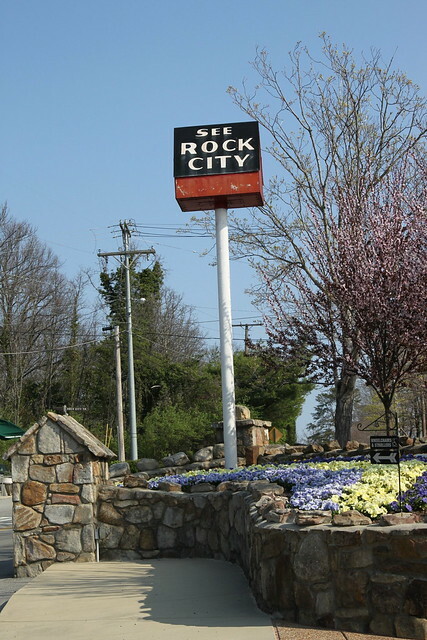 I loved Rock City the best of all the attractions. Did you go to Ruby Falls too? That was interesting but still Rock City beats it. The riverwalk and park below are great, plus that artsy section of town just beyond the walking bridge. Great stuff that town has to offer. If you’ve never been to Indianapolis, my city, you should make a trip. We have an awesome Children’s Museum and so much to do here. We’re a very friendly city too. That was so great. Thanks for sharing. I love family vacations with the kid!! Our spring break (in Alberta) is still 3 weeks away, but we literally have just had 3 feet of snow (no buses yesterday or today) so our spring break holiday might be a little more…. indoors!! 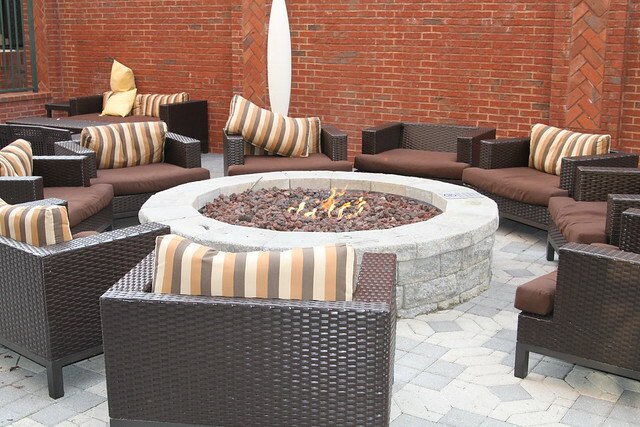 Gas logs for a fireplace are growing a lot in terms of popularity every single year. Gas logs for fireplace Because of this, manufacturers that are producing them are working on a lot of plans to meet the ever increasing demands from people. We LOVE Chattanooga!! And we’ve even stayed in that Courtyard before. Chris LOVED that it had those balconies. Chris worked on the Aquarium addition a few years back (pre-kids). We haven’t yet taken Ali to see it – she would LOVE it!! What a wonderful place! 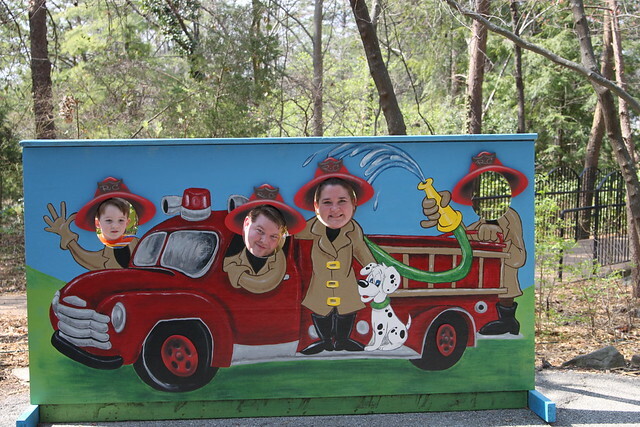 Your kids looked like they had a BLAST! Looks like fun! We are in need of a vacation. I will be checking this place out for sure! What a fabulous day you all had!! And a great city! This was just the most endearing, sweet, and thorough sharing of your trip and travelogue! Thanks for sharing. You have a wonderfully personal way of writing! I would read a book on travel if it had your name on it! Came across your blog by chance today as I’m planning a mini-vacay with my kids on Memorial Day weekend this year in Chattanooga, TN. Great advice! Thanks for posting the information and sharing the photos. I’ve signed up to follow your blog please keep posting 3-day mini-vacations with kids, you’re great at it. I am planning a mini vaca for the family to Chattanooga in July. Thanks for the great tips! We are very excited about our trip there. Since you stopped at the Chattanooga Choo Choo, would you recommend staying there? Appreciated your post and pictures as we are planning a TN trip. Thanks! I lived in Chattanooga for several years and now live just across the state line in GA. I fear that you missed one of the best kids attractions in Chattanooga. 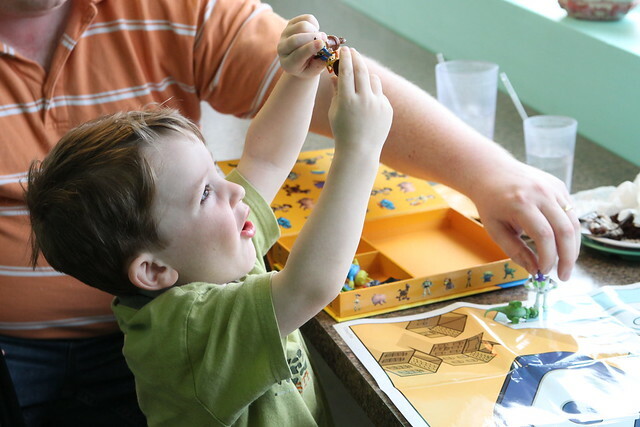 The Creative Discovery Museum is great for kids of any age and they are open year round. If you come to Chattanooga during the holidays, be sure to check out Rock City at night. They have their City of Lights during the Christmas season with Christmas lights everywhere. It’s beautiful. Parts of the park are closed (like the swinging bridge, sorry G) but it’s quickly forgotten when you see Chattanooga lit up from the overlook. Also if you come back, don’t forget to check out N Ga attractions as well. 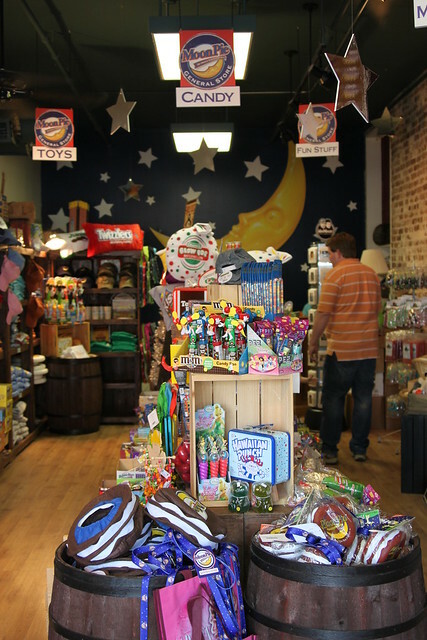 There are petting farms and hiking trails all around this area, but not always as touristy as Chattanooga itself. 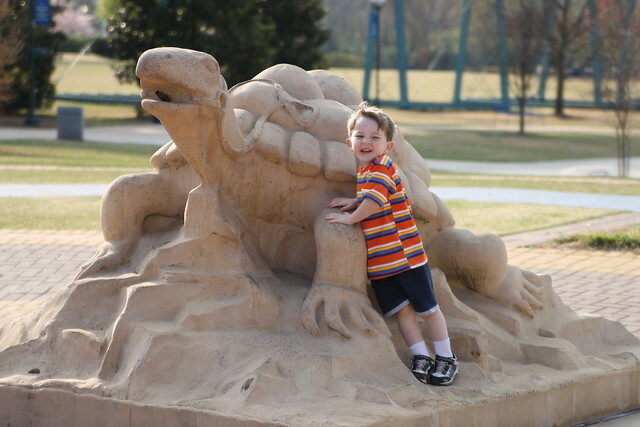 There is also the Chattanooga Zoo at Warner Park. We went there a couple of weeks ago with my daughter (2.5 y/o) and she loved seeing all the animals. They have a red panda exhibit that is fun to watch and a Camel experience that you can actually ride on a camel. If your little one likes sports, the Lookouts baseball team is a big draw to the area also. Games are inexpensive and I have yet to find a bad seat, though some are better than others. Hope this has been helpful to you for any future trips you may make to Chattanooga. I agree that it is a beautiful city and it appears you hit quite a few of the main attractions. Sorry you missed the Ocean Journey side of the aquarium. It’s the newest addition and is worth seeing. Also, like you, I prefer to eat at a local restaurant instead of a chain, and there are several of our favorites in Chattanooga. If you need any ideas or suggestions, just send me an email and I will give you some suggestions if you like. Hope your next trip is even better. Wow, that was an amazing review! We had a great time in Chattanooga, TN over Thanksgiving. 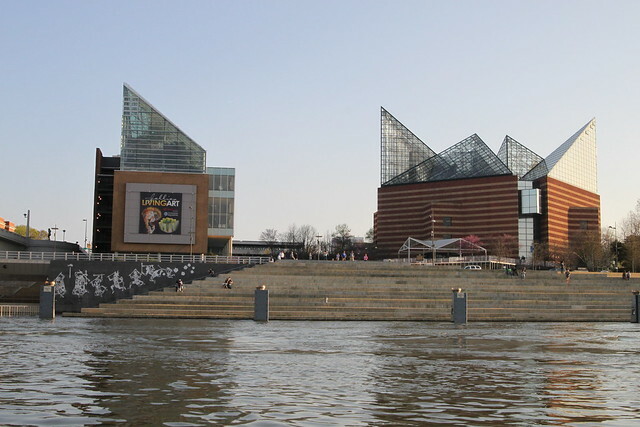 Our highlights were certainly Lookout Mountain, the Incline Railway and Rock City, but we also enjoyed visiting North Shore and playing in the open space at the park on the waterfront. 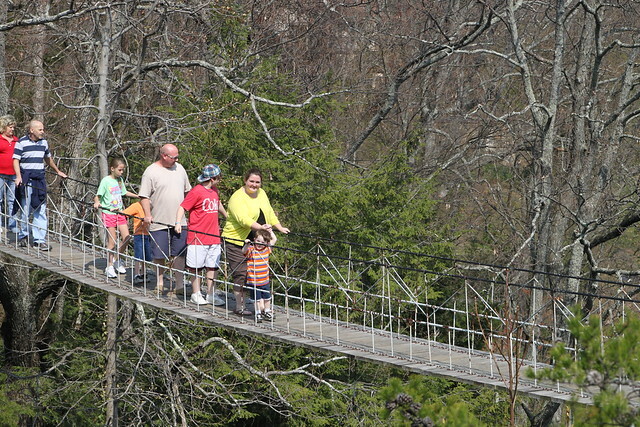 We got some great pictures on the world’s longest pedestrian bridge at Walnut Street Bridge. thank you for this! 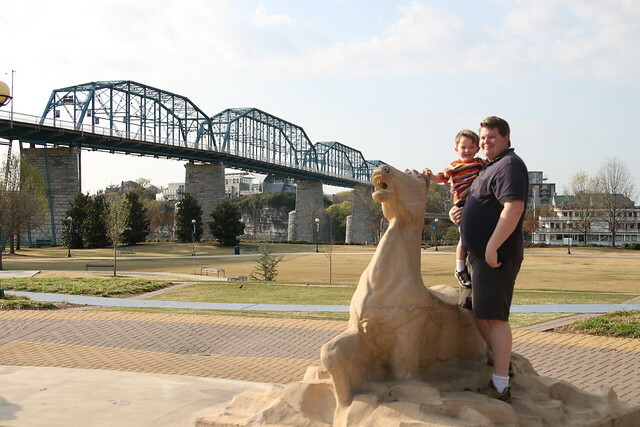 We have already been to Chattanooga once and are planning another trip with our 2 year olds!